Hohner Harmonica Review Plus Harmonica Accessories! “Hohner” are arguably the biggest name in harmonicas and the oldest manufacturer in the world. Hohner have a reputation for quality instruments that are used by the most renowned harmonica players around the world today. They also come in quantities of more than one shown in the picture below. Marine Band is the base model of the line technically named the Marine Band 1896/20 for the year it was introduced and the twenty reeds it possesses it has been the basis of several Hohner’s harmonicas over the years. It also has some tuning variations like the 1896N (natural minor key) and the 1896H (harmonica minor key). The Marine Band has been hohner’s most popular model of harmonica for generations. made in Germany on a wood comb, most blues and rock artists play a Marine Band such as (Bob Dylan), John Lennon, Bruce Springsteen, Little Walter and Neil Young. The Special 20 (#560) was introduced in the mid 1970’s it has the same reeds as a Marine Band but it has a plastic comb instead of a wooden comb rounded edges on the cover plates. It was the first Hohner harmonica to have a plastic comb which not only made the instrument airtight but also eliminated the swelling which changes the pitch of the harmonica wood combs swell in weather changes and moisture their usually played inside made in Germany, this model quickly became the preferred choice of many rock and blues players. Now most harmonicas being manufactured from all companies are based upon the Special 20. It’s most noted for Harmonica Player John Popper. Like the Marine Band 1896, the Special 20 also has tuning variations available, like the #560C in country styled tuning, and the # 560N in natural minor. The Marine Band Deluxe has all the features of the original Marine band with tighter construction and a new cover design which creates a greater volume. The Marine Band Crossover also features the same reeds, but is made on a bamboo comb that is water repellent. The Marine Band Thunderbird is a model of low and supper low pitched 10-hole diatonic harmonicas that were introduced in 2011. It possesses a bamboo comb like the Crossover and a conical shaped lower cover plate. Designed by harmonica player and customizer (Joe Filsko) this helps reduce any rattle caused by the low frequency tone produced by the reeds. 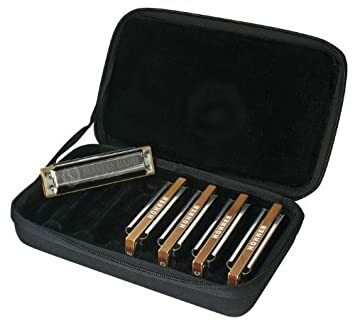 It’s available in low major keys A through F, as well as low B-flat and E-flat, and double-low F.
Have you ever seen a hohner Marine Band harmonica? Have you ever seen a hohner Special 20? Have you ever seen a Marine Band Deluxe? Have you ever seen a marine band Crossover? Have you ever played any of these harmonicas? Have you ever owned any of these harmonicas? “This Guy Wails” I have some more examples of (All About Harmonicas & Famous Harmonica Players) Playing different kinds and styles of “Hohner Harmonicas”.John Mayall in the picture was born on the 29th of November 1933 and grew up in Manchester England. He started the band John Mayall’s Bluesbreakers featuring Eric Clapton on Guitar. Looks like he’s Playing a Hohner Marine Band Harmonica in the picture above. He’s using a Vocal Microphone to play the Hohner harmonica through which gives you a more clear crisp sound verses the muddy blues sound from the Green Bullet Microphone.